The performance and reliability of the Internet depend, in large part, on the operation of the underlying routing protocols. Today’s IP routing protocols compute paths based on the network topology and configuration parameters, without regard to the current traffic load on the routers and links. The responsibility for adapting the paths to the prevailing traffic falls to the network operators and management systems. 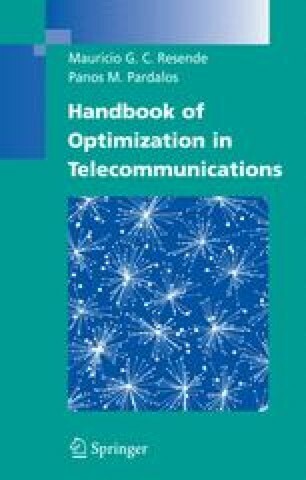 This chapter discusses the modeling and computational challenges of optimizing the tunable parameters, starting with conventional intradomain routing protocols that compute shortest paths as the sum of configurable link weights. Then, we consider the problem of optimizing the interdomain routing policies that control the flow of traffic from one network to another. Optimization based on local search has proven quite effective in grappling with the complexity of the routing protocols and the diversity of the performance objectives, and tools based on local search are in wide use in today’s large IP networks. Cariden MATE Framework, 2005. http://www.cariden.com/products/. J. Winick, S. Jamin, and J. Rexford. Traffic engineering between neighboring domains. http://www.cs.princeton.edu/~jrex/papers/interAS.pdf, July 2002.